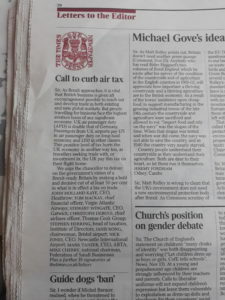 Today, (14th November) leading businesses and business groups including the Federation of Small Businesses and Institute of Directors have backed the call by the A Fair Tax on Flying for a reduction in Air Passenger Duty. In a letter to the Times the businesses urge the chancellor to deliver on the government’s vision of a Brexit-ready Britain by making a bold an decisive cut of at least 50 per cent in what is in effect a tax on trade. As Brexit approaches, it is vital that UK business is given all encouragement possible to reach out and develop trade in both existing and new global markets. But people travelling for business currently face the highest aviation taxes of any significant economy. UK Air Passenger Duty (APD) is double that of Germany. Passengers from UK airports currently pay £75 in Air Passenger Duty on long-haul economy and £150 in other classes. This punitive level of tax hurts the UK economy in another way too, as travellers seeking trade with, or investment in, the UK pay this tax on their flight home. We urge the Chancellor to deliver on his and his Government’s vision of a Brexit-ready Britain, by making a bold and decisive cut of at least 50% in what is in effect a ‘Tax on Trade’. Manoj Gunawardena, Regional Head of Europe & Americas, SriLankan Airlines Ltd.